Shipping varies based on location and the contents of the shopping cart. 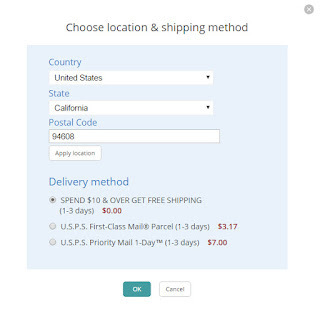 If you live in the United States and spend over $10 you will get free shipping! Shipping for the US starts at $3.00. I send first class mail and priority mail. First class mail usually takes at least 3 days while priority takes less than 3. Your cart contents are stored here for 30+ days so you can return anytime. You can also create a "favorites list" so you can save your favorite pieces for the future. *You do not have to create an account to purchase or favorite something. 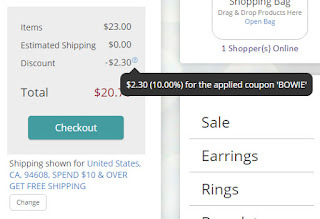 For shipping discounts, coupon codes can be added towards the bottom of the page. Look for the "Coupon code" section, put in one of the special codes and click on "apply." Shipping policy - About returns, exchanges, jewelry care and payment options.